Most people who lived on the north side of Indianapolis in the second half of the 20th century were familiar with one or more (usually more!) of the Chinese restaurants in the area. There were not as many options for dining out in those days as there are now, so the Indianapolis eateries that did exist enjoyed considerable popularity. They were family-owned businesses, typically employing multiple generations of the same clan, as well as their extended relations and friends of the families. In addition to dine-in facilities, the Chinese restaurants were famous for their take-out service, long before restaurants with other kinds of cuisines got on board with carry-out. The Mandarin Inn was located in the Ma-Co Building on the southeast corner of E. 38th Street and N. College Avenue. 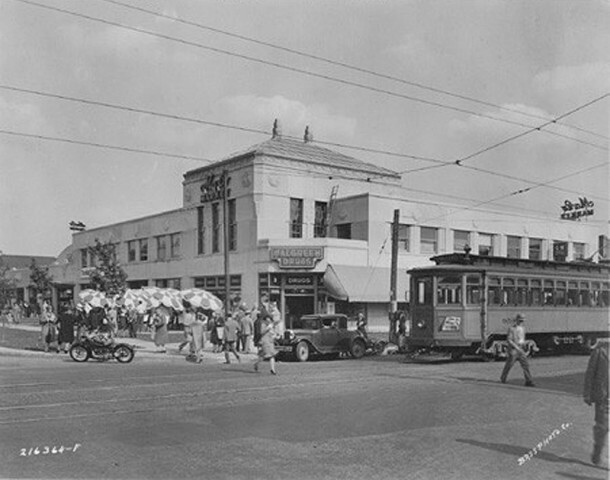 The original name of 38th Street was Maple Road, so the Art Deco building got its name from the first two letters of the intersecting streets, Maple and College. The Ma-Co Building was the subject of a “Then and Now” article by Joan Hostetler back in 2011, which you can read by clicking here. The earliest city directory in which I could find the Mandarin Inn listed was the 1945 edition. According to that entry, the Mandarin Inn was operated by Harry K. June. The directory listing did not indicate whether he was the owner or a manager. In the early 1950s, the Mandarin Inn was managed by Daniel M. Lee, who later opened his own restaurant a couple of miles way, called the Lotus Garden. By the late 1950s, the Mandarin Inn had been purchased by Edward, Henry, and Paul Cheung. Other persons associated with the Mandarin Inn over the years were Stanley Cheung, Frank Young, Allen Wong, and Wong Man Ching. 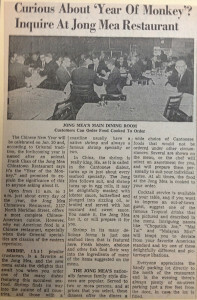 The elder Cheungs had previously operated a restaurant in the Stone Hotel, whose address was listed in Indianapolis city directories of the 1950s as being at 237 South McCrea Street. That address does not exist today, but it appears to have been located in the building now known as One Jackson Square. The current tenant on the first floor, where the Cheungs’ previous restaurant was located, is Ike & Jonesy’s. The Stone Hotel was originally called Hotel Spink, when it was built in 1924. The Mandarin Inn ceased operation in the late 1980s. The Ma-Co Building was demolished in about 1992, despite protests by people in the Mapleton-Fall Creek and Meridian-Kessler neighborhoods. The unique building was replaced by a typical, modern-day, freestanding Walgreens store. Coincidentally (or perhaps ironically), the Ma-Co Building’s primary tenant when it first opened back in 1930 had been Walgreen Drugs. Another popular Chinese restaurant that appeared mid-century was the Lotus Garden, which was located in the Town & Country Shopping Center. The restaurant had an address of 4424 Allisonville Road, but most people accessed it through the parking lot from the 4400 block of North Keystone Avenue. 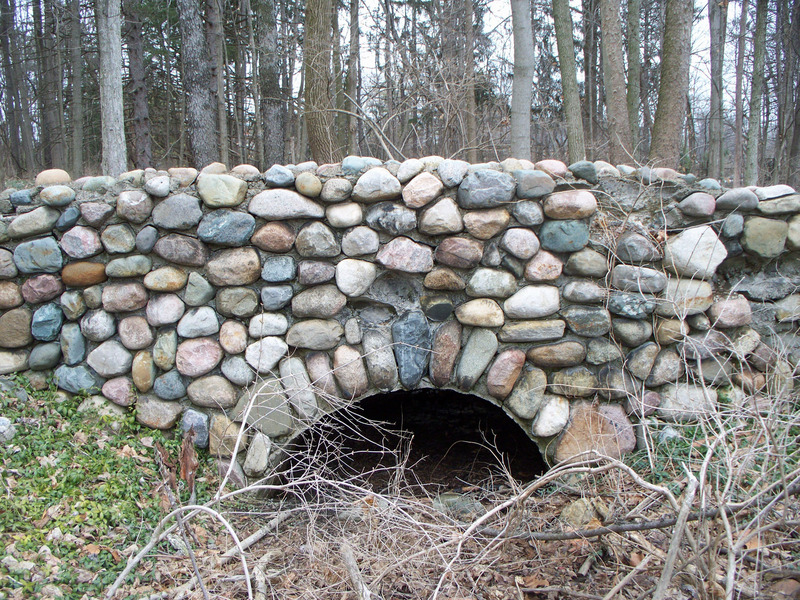 The land on which the shopping center was built was formerly owned by the Hammond family, whose Hammond’s Grove, a park that was adjacent to Fall Creek, was the subject of a previous HI Mailbag column in March. The Lotus Garden opened in 1953. It was originally owned by Lee Chow Yee, Daniel M. Lee, and William Taw. Daniel Lee had been the manager of the Mandarin Inn in the years just prior to striking out on his own. Yee’s son Hauk Yee and Daniel’s son Lum Lee were also involved. In later years, William Taw, Jr., assumed management of the Lotus Garden. A second and third location of Lotus Garden were opened in Greenwood and in Carmel. The Greenwood restaurant is the only one that is still in operation today, but the original families are no longer involved in the business. 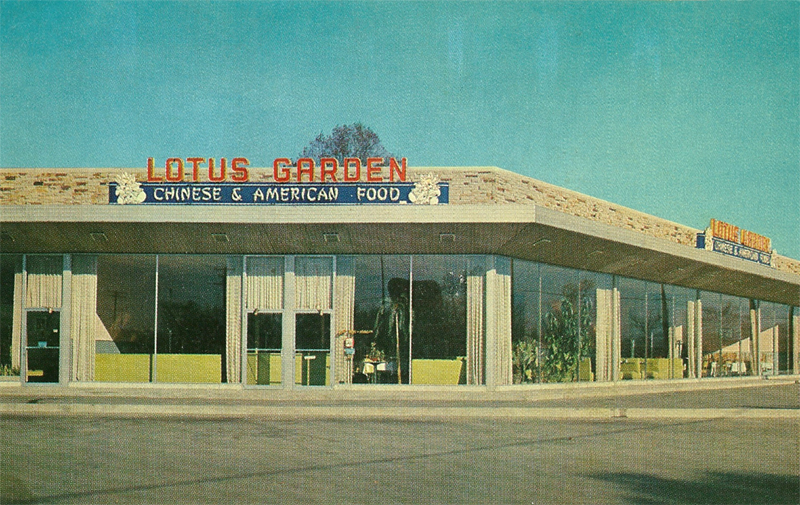 The original Lotus Garden in the Town & Country Shopping Center closed about 1999. Other businesses have occupied that site since the Lotus Garden left, but the building is currently vacant. Jong Mea was located at 2137 N. Meridian Street. Its founder and first president was Irving Chin. Later generations of the Chin family, including Hank Chin, Susan Chin, and Edward K. Chin were involved in the restaurant’s operations. 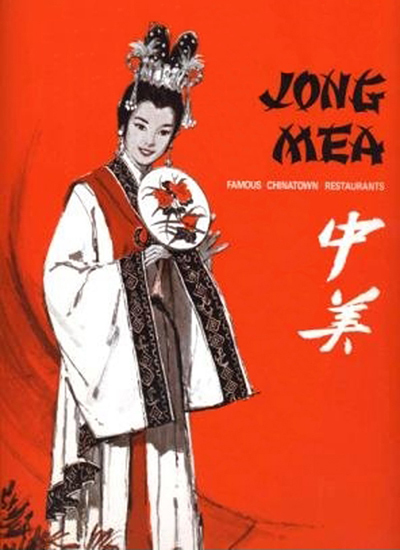 The Chin family also owned Jong Mea restaurants in Columbus, Ohio, and Mansfield, Ohio. According to Irving’s granddaughter, Lani Chin, who now lives in San Francisco, California, the first Jong Mea was established in Columbus, Ohio, in 1951. The Indianapolis restaurant opened a few years later. When she was young, Lani Chin’s parents told her that “Jong Mea” meant “Chinese American,” but she says she later learned that it can roughly be translated as “Midwest.” In either case, the name fit. Lani Chin also reports that the Indianapolis location of Jong Mea closed in 1998. The building that once housed the Jong Mea Chinatown Restaurant also met the wrecking ball. The former Jong Mea site remains a vacant lot today. If any readers have memories of the Mandarin Inn, Lotus Garden, Jong Mea Chinatown Restaurant, or other northside Chinese Restaurants you’d like to share, please comment below this article. If anyone has photos of these establishments or any memorabilia such as menus, coasters, or matchbooks, HistoricIndianapolis.com would appreciate having copies or scans of them. Thank you for the article. My grandma worked as a waitress at the Mandarin Inn in the late 50’s. I have photos of her as a waitress at the Mandarin Inn. After leaving the Mandarin Inn, she went to work at the Tea Room at Ayres, and worked there as a waitress until it closed. Thank you for sharing that information. If you have the ability to scan the photos of your mother (at either the Mandarin Inn or the L. S. Ayres Tea Room), we’d be glad to have copies of them. Send them to historicindianapolis (at) yahoo (dot) com. Thanks! I will scan the photos and send them to you. My grandma would love that I shared the photos. I have a scan of L.S. Ayres employees at a Christmas gathering 1946 in the Tea Room from my wife’s family. I see you wanted those. I will try to send it by end of week. Ate at all of these 3 establishments many times and enjoyed them all. The Jong Mea was our favorite, especially the Sweet and Sour Shrimp, as the shrimp was not breaded as many of the other Chinese restaurants always seem to do. Enjoyed so many of their other dishes also. Miss this place every time I drive downtown on Meridian Street. Was so sad when the wrecking ball took down the Mandarin Inn. So sad that Indy continues to destroy beautiful buildings with great history. And just for another drugstore, which all seem to refuse to try to adapt to “fitting into” the older architectural scheme and throw up a cookie cutter store that fits in a strip mall in Anytown USA. Money talks! Like you, I also dined at all three of these establishments. Just as often (maybe more), I picked up a carry-out order. If I was going to or coming from work downtown, I would go to Jong Mea. If I was at home at any of the various houses I lived in over the years in Mapleton-Fall Creek, Meridian-Kessler, Butler-Tarkington, or Broad Ripple, I would go to Mandarin Inn. If I was on my way to a relative’s or friend’s house anywhere east of College Avenue, I would go to Lotus Garden. Like you, I too am very sad that we have lost many wonderful structures that were part of our city’s history. From residences, to churches, to schools, to commercial buildings, they were discounted, discarded, and destroyed in the name of progress. Fortunately, more and more people seem to understand that there needs to be more thought given to the demolition of buildings that were erected in a time when the style, materials, and craftsmanship were something to behold. I never ate at Jong Mea, but will always remember the cool sign along Meridian Street when I first moved here in the early 90s. The Ma-Co building was also standing at the time, and sadly, I now see that the Walgreens that replaced it is now closing. A great example of why preservationists should continue to fight the building of these drugstores in the urban core. Now we have a horrible vacant 1990s building in the place of what was a beautiful example of Art Deco in this city. Sad! The Ma-Co Building served the community for more than 60 years. The Walgreens store has been there barely 20 years. If the building sits vacant for any length of time, it will be vandalized and falling down before you know it. When I was a child, one of my greatest delights was to accompany my folks to Mandarin where they asked to have their carry-in pots and pans filled with delicious Chinese fare. We also loved a later restaurant, the Lantern Room at 38th and Meridian (southwest corner). What a great idea to take your own pots and pans to the Mandarin Inn for your carry-out dishes. It reduced the restaurant’s cost of doing business, it put the food in the same containers in which the food could later be warmed up at home, and it kept a few paper or cardboard items from ending up in the trash (which in those days people often burned in their back yards or the alley behind the lot!). Your parents were already doing their part to save the planet. Thanks for the great short history of the Chinese restaurants in Indianapolis. My parents and uncles owned the Mandarin Inn, and my brother and sister worked there throughout our early teens and early adulthood. We all had many memories, and we want to thank everyone for their great support and all the egg rolls, egg foo young, shrimp fried rice and sweet and sour pork your ordered! We knew the families at the other restaurants and had great times playing basketball and just getting together. I am on the West Coast now and still come across people who grew up on the “Midwest” version of Cantonese cooking. I know when they ask for pressed duck and moo go gai pan. Thank you for sharing a little info about your family. It’s interesting to know that many of the members of different family-owned restaurants liked to “hang out” together. It makes sense, though, that you would enjoy one another’s company and give one another support, even though you were competitors. You had common goals and common obstacles in your pursuit of the American dream. It would appear that some people got their start in one of the established restaurants and then in later years opened their own restaurants. Is there anyone in the family who might have photos of the Mandarin Inn, either exterior or interior? It would be great if we could get some high res scans of the restaurant. I celebrated my 11th BD w/family at the Mandarin Inn on 38th St, back in ’72. I still have a doll my parents purchased for me that night. I was very sad to hear that it closed. The restaurant I associate with Chinese food in Indianapolis during my “formative years” was Chung’s Lantern Room, just south of the southwest corner of Meridian and 38th Street. Several other commenters have mentioned Chung’s Lantern Room. Until now, I had not checked for information on it, as I did the three Chinese restaurants mentioned in the question. It would appear that the Lantern Room opened about 1950 or 1951 and operated for at least 25 years. It was located in the northernmost storefront of a one-story building at 3768 N. Meridian Street, which is still standing today. 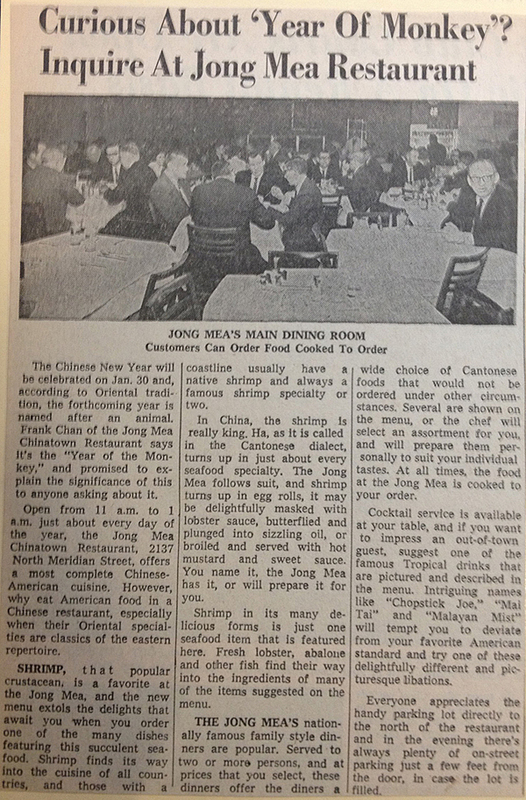 In city directories of the 1950s, the personnel of Chung’s Lantern Room were listed as Hon Y Chung, president; James Get Wong, secretary; Jack Yung, treasurer; Joseph C. Chung, general manager; Henry G. Chung, waiter, and Yueck Chung, cook. Great article on restaurants we have enjoyed in years past. How about Chin’s restaurant, downtown Indy? Betty Chin was SHS Class of 1961, I believe. Thanks for making me aware of Betty Chinn’s parents’ restaurant. My article focused on the three northside restaurants that were referenced in the HI Reader’s question. I know there were other Chinese restaurants around town, but I had a hard enough time paring down the material for just the three that were specifically named. I just did a little checking, though, and I found there was a restaurant called the Chinese Palace at 225 N. Pennsylvania Street that was owned by Poy and June Chinn. That address would have been in the block where the Indiana National Bank Tower (now Regions Bank Tower) was built in 1970. Could this have been Betty’s parents’ establishment? Yes, Chinn’s rest at 225… We (Betty and I) would take the bus from SHS and visit her mother/father and sip tea. Her sister as I recall, worked there in the afternoons. Poy (Gene) Chin later worked at Golden Phoenix restaurant (in the front) for many years. June Chin worked at Jong Mea (also in the front) for several decades. From 1968-1973 I served on former Congressman Andy Jacobs’ staff. He once told me that his first job was busing tables at the Mandarin Inn for 25 cents an hour. This would have been in the late 1940’s. The first home that I bought was in the 500 block of East 37th St. We were frequent diners at the Mandarin Inn, as well as at Sandy’s Town Tavern directly across College from the Mandarin. They were both within easy walking distance. This was in 1967 and 68. Being from a fairly large family, we hardly ever went out to eat. Not only was it expensive for 9 people to eat in a sit-down restaurant, there was also the fact that we couldn’t get everyone in the car at the same time to go there. One of the times I remember gettng to eat out was on my 15th birthday. 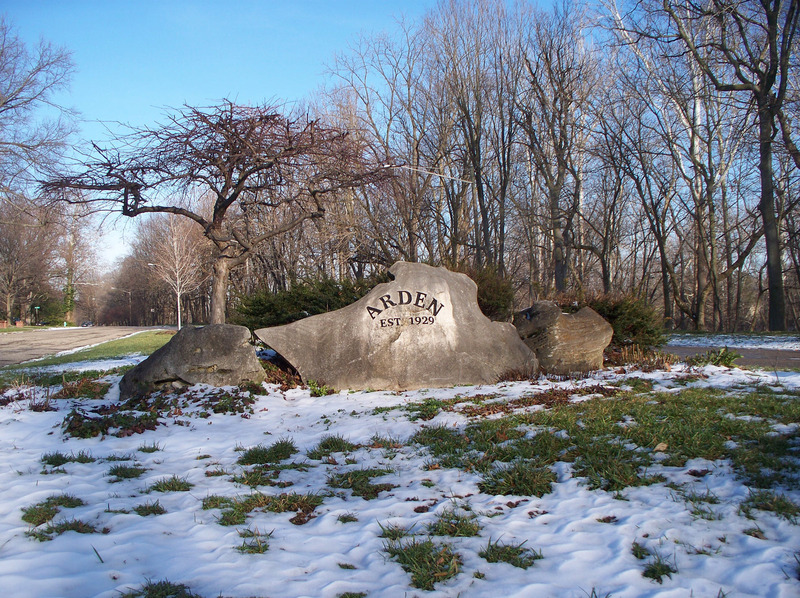 We went to Sandy’s Town Tavern, a place my father had been to with his buddies from work. The thing I remember most about that occasion was not the food or the service. It was that we were not allowed to enter the establishment through the front door, because Sandy’s was a bar. They had fashioned a family dining room at the back of the building, near the alley, and anyone with a minor in its group had to go in through a separate door to that room. 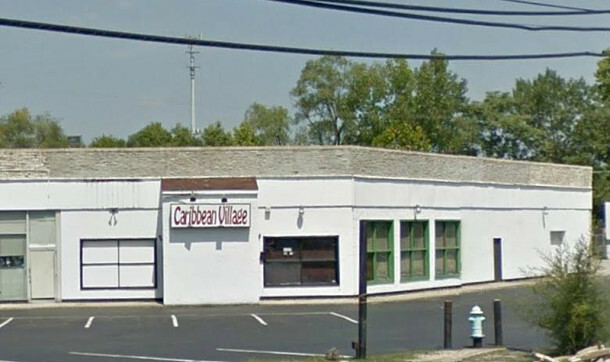 Hi Sharon–We were patrons of all of these, but lived catty- corner behind the Mandarin Inn. One of the families who either owned or were otherwise connected to the restaurant lived behind us and had a garden of Chinese vegetables in their back yard. I remember seeing a small elderly woman with a short wooden stool tending the plants. We didn’t speak the same language, but always waved and said hi. As a kid I wasn’t that fond of Chinese food, but my parents were. I probably ordered something totally ordinary and always got the peppermint stick ice cream for dessert. My other multi-sensory memory of the Mandarin Inn was walking through the heat and smells of their exhaust fan every weekday as I walked home for lunch from School 66. Wow. Your comment has led me to some interesting (and embarrassing) discoveries. The owner of the home at 3741 N. College Avenue was Daniel M. Lee. It must have been his mother or his wife whom you saw tending the garden in the house behind yours. Daniel Lee appeared as one of the owners of the Lotus Garden in the 1954 city directory, so I assumed the Lotus Garden was the only restaurant with which he was associated. However, I just now looked for his name in earlier city directories, Lo and behold, I found him in the 1949, 1950, and 1951 publications as the manager of the Mandarin Inn! No wonder he lived in a house immediately south of it. As a result of finding Daniel Lee’s listings, I have therefore discovered that the Mandarin Inn existed many years before I previously thought it did. In 1945, the Mandarin Inn was operating at 3775 N. College Avenue under the management of someone named Harry K. June. Obviously, there was a previous owner (or owners) before the Cheung family took over the Mandarin Inn in the 1950s. This would seem to provide a relatively conclusive answer to the question of which of the three ( Mandarin Inn, Lotus Garden, or Jong Mea ) opened first. It had to have been the Mandarin Inn. Growing up outside of Indianapolis in a small town, and one spring a team mate on the track team pulls me over at practice and asks would I want to go with his Freshman sister and with his family to Indy to the Flower and Patio Show and to eat at a Chinese restaurant. It seemed a little weird but I liked the guy well enough and figured he wouldn’t set me up with his sister if she ONLY had a great personality, which she did. So then being a Gomer myself and not knowing what to order at The Mandarin Inn, I took the family father’s suggestion of, you knew it was coming, Chop Suey, the ultimate Midwest Cantonese dish, I suppose. I do remember being impressed by the different looking building, closest things to it in my hometown were the Coca-Cola bottling plant facility, and the Best-Ever Dairy building. I later realized they had some art deco facade features that were similar. Sad, in those days Coke and Best Ever could produce classic architecture for buildings even in small towns, and Walgreen’s just obliterates it all with cookie cutters everywhere today. Later in the 70’s, a mentor took me to Jong Mea for the first time I was ever there, and I really enjoyed the food and interior atmosphere. Ate there a lot of times on the way to the old Hummingbird Cafe over at 22nd and Talbott to see John Hiatt or Caroline Peyton. There was at least one other Chin family restaurant in Indianapolis. Jimmy Chin entered our class at School 80 in 1951-52, moving from Charleston, SC. We teased that he had a “Southern Chinese” accent. His family, which had fled from mainland China in the late 1940’s, opened a restaurant in Broad Ripple on Guilford in the block north of Broad Ripple Avenue. The Mandarin Inn, however, is my best-remembered restaurant. The chefs there would let small children wander into the kitchen (briefly, but still!!!) where we would be given Chinese taffy-like candies, wrapped in exotic paper with Chinese characters. It was definitely a family restaurant, where the waitstaff remembered your favorites and greeted your mother by name. My favorite “going to the Mandarin” story comes from my friend Connie’s mom, who would look around her living room in the late afternoon, announce that she was counting ears, or eyes, or any body part which came in pairs, and that the total made far too many people to cook for, so we were going to the Mandarin! My brother always ordered chicken liver chop suey, which I haven’t seen on a menu since! Wonderful memories, Sharon. I tried to look up the name and location of Jimmy Chin’s parents’ restaurant. The only directory available in the online IUPUI Digital Archives in that time period is the 1951 edition. I looked at all of the businesses on Guilford Avenue from the 6200s through the 6300s, but none appeared to be a Chinese restaurant. The food-related stores were: 6304 Guilford, Maplehurst Jersey Farms; 6308 Guilford, North Side Delicatessen; 6315 Guilford, Salvatore J. Bruno, grocery; and 6319 Guilford, Roth’s Market. Can you tell me if the Chins’ place was on the east side or the west side of the street? I’ll search other directories, the next time I am at a library with directories from other years. It didn’t stay there many years — as I recall, it was on the same side as Bruno’s, but I can’t remember if Mr. Bruno was gone by then. At Broad Ripple Avenue was the drugstore; then an alley? then Bruno’s. Then a dress shop possibly replaced by part of the Chins’ space. It’s too long ago! I remember Jimmy in sixth and/or seventh grade — and then I moved to John Strange School. You had a section that told about the food-related places in the 6300 block of Guilford in Broad Ripple. You said that Bruno’s Market was at 6315 Guilford. I remember the stores well because my dad’s store, Holland American Pastry Shoppe, was at 6315 Guilford. Also on the same side of the street was Brothers Flooring north of the alley, Bruno’s Market, Handy Hardware, and there was a building that housed a photography business, and I remember a dentist in there too, and you had to go upstairs to access these places. Fox Delicatessen was next to my dad’s store, with Bunks Pizza, and The Patio, when it was just a small bar, across the street. A couple of stores north of The Patio was another small deli but I don’t recall the name. Well, Sharon, here you’ve hit on a topic dear to my heart – the old northside Chinese restaurants. Our family ate at all of them, tho not as often at the Mandarin Inn, for I’m not sure what reason. I remember going there more when I was a bit older, but not so much as a youngster. The one I went to earliest and was my intro to Chinese food when my dad would bring home eggrolls, was the one not initially mentioned in this article, The Lantern Room. Noticed someone did mention it in the subsequent comments. They also had really good prime rib, which I ate until I got familiar with Chinese food, little by little. Best egg rolls by far, tho, were from Jong Mea, and best sweet and sour sauce to go with them. Also, Young Chow fried rice – I ate Jong Mea’ s fare well into my 30’s when I lived at 20th and Delaware and it was just a hop, skip and jump away. Still miss it now. And Lotus Gardens – there was a time when our family seemed to eat there almost every Sunday night, and evidently, so did everyone else we knew. Couldn’t go there without seeing half the extended family and many family friends on any given Sunday. Loved their Cantonese chicken chow neon and pepper steak with tomatoes. Saw that someone mentioned Sandy’s Town Tavern, too. Tho not a Chinese restaurant, it came to my mind when thinking about restaurants in the area. Great steaks and lobster there. That building has been thru a lot of incarnations, and is still standing, beat up and dilapidated. Did not know until just reading it here that the Walgreens was closing. With that happening, probably not much hope for anything promising to happen in that area. I’d love to go to the Oriental Inn for dinner with you some time, just to take in that feeling of times gone by. I love this, brought back so many memories of the Lotus Garden in Carmel! I lived in Westfield (’76-84), my teenage years at 161st and US 31 N. There were basically three restaurants in the area, Pickets Cafe in downtown Westfield, The World’s Largest Dairy Queen – really the sign said that! And there was one other breakfast-ish country place off US31N and 186th (or so). My boyfriend and I would “go out” for an upscale date to the Lotus Garden at the end of Rangeline Road where it came together at 31 N; it was by a Dairy Queen that was owned by the same family for years. Lotus Garden was so exotic for us as our parents would have never taken us to Chinese (or anything not steak-n-potato or fried chicken type) places. We loved, loved the pork fried rice (I’ve never found anything that can match my memory of theirs), BBQ pork, some type of spicy beef and broccoli entree and Hot and Sour soup. I know that doesn’t seem like we tried much, but for kids from Westfield (ages 16 and 17), we felt like world travelers! I hated it when the owners sold it to another place that went to a buffet place and then closed a few years after. Oh, and I forgot the egg rolls, warm and crunchy – the best! You got my memories going of the “exotic” waitresses (we were young and obviously not exposed to much – lol), the red drapes, white plates, little tea pots, and the fun take out boxes. Ok, I know, the “fun take out boxes”, again, remember this was Westfield 38 years go with 90% cornfields and the new “rich” neighborhood of Village Farms”. Ok, I’ll put my memories away… Fun posting about this!! 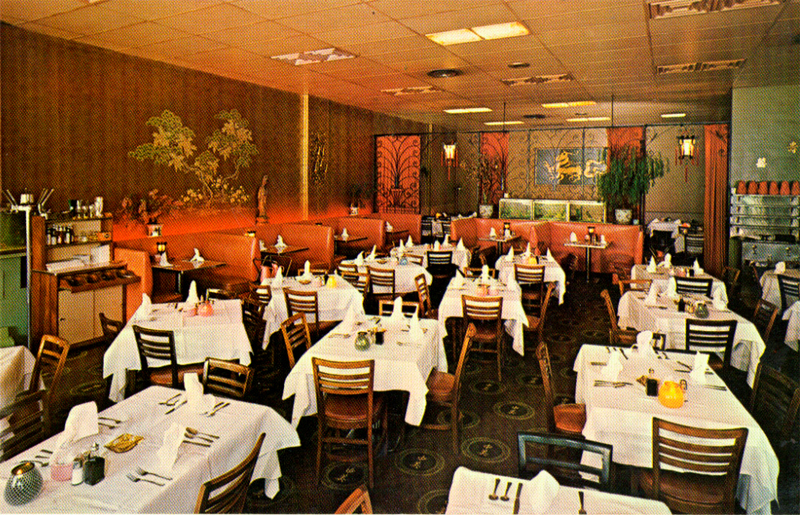 The Mandarin Inn was my introduction to Chinese fare in the late ’60s and 70’s. My family ate there at least once a month. Today my brother and I compare it and its food to all of the other Chinese restaurants in Indianapolis and surrounding area. None compare. They definitely had a flavor all of their own. 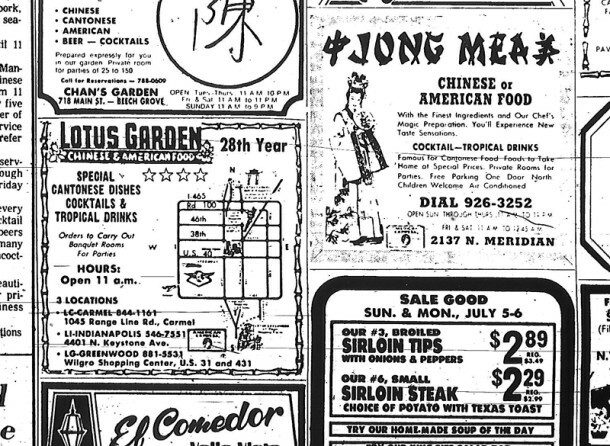 It’s been great to hear from all of you on the history of all the great Chinese restaurants in Indpls. Many people have asked about our egg rolls and our sweet and sour sauce. Here’s what I remember… the egg rolls had chopped BBQ pork, bay shrimp, bean sprouts, and Chinese celery cabbage. The sprouts and cabbage were blanched and compressed. I remember my Uncle Paul placing 50 lb cans of soy sauce on top of the mixture to compress the water out. The bbq pork and shrimp were added along with peanut butter and 5 spice powder and mixed… and then we spent the day rolling the mixture into the egg roll skins. The sweet sour sauce we made ourselves and I’ll have to look up my records for that. The hot mustard was cold water and lots of Coleman’s dry mustard. I remember the fumes from doing that making your eyes water. Every restaurant made their egg rolls and sauce their own way. You got 3 big egg rolls for $1.50! My first date was at the Jong Mea Restaurant. A boy from my church ask me to go with a group after church to the Jong Mea. I was 15, but my parents let me go since there were several going. What wonderful, innocent memories. My date, Jart Taylor, has since passed away. We both married other people, but kept in touch through family connections. Thank you for sharing your memory of dining at Jong Mea. A first date is a memorable occasion. It’s bittersweet when the person is no longer with us. I’m sorry for your loss. Thanks to Sharon (Butsch) Feeland for posting this memory reminder. Wow, such a great article. I have many memories of both Lotus Garden and Jong Mea. The Yee family actually lived right behind us in Indianapolis for a while. My father discovered their restaurant while on a business trip to Indianapolis from Pennsylvania. When we moved to Indy, he started taking us to the Town & Country location almost every Sunday after church. I wasn’t even born yet, but some of the first solid food I ate was from Lotus Garden, I’m sure. I grew up checking in on the fish in the giant fishtank that separated the lobby from the bar. That location really had a great ambiance that you simply cannot find in restaurants today. It felt cozy and warm, everything seemed to glow. Their egg rolls STILL are the best in the state. Later when I was a teenager, I worked 2 summers at Lotus in Carmel as a busboy as we had moved north. Of course, the location was not the same and the realities of working in a restaurant quickly dispelled any romantic notions I had of Lotus. But the eggrolls… oh the eggrolls. I’d use up my tips buying them! When I got older, a favorite downtown eatery was Jong Mea, and as bad as this sounds, we loved it because we were always certain to get a table at noon due to how slow things were in the 80s. And they made killer cocktails! I really miss that place, a great place with typical Muzak and old-style booths. I wish they were still around. You still can almost get that feeling at the Lotus in Greenwood if you sit in the bar. We hit that place twice a year, even though it’s an hour away from us now. I hope they never close, that place is a big part of my life. Fond memories of Mandarin Inn, Lotus Garden, and Jong Mea. Were the Cheungs mentioned in the Mandarin Inn history the same family that went on to found House of Cheung? No, I don’t think so. I knew both families, and my mother worked with all of them. Peter, the owner of House of Cheung, cooked at Mandarin Inn before opening his restaurant, but I don’t believe he was related. The owners of Hong Kong Inn also had the same last name and once worked at Mandarin Inn, but I don’t believe they were related either. Jeff Cheung, who has also commented, would know better than I. The Mandarin Inn Cheungs are related to people who owned a couple of other restaurants, one in Mooresville and one on West 38th. My Dad worked at the Mandarin Inn and Jong Mea’s back in the early 1960’s. His uncle was a partner in the Lantern Room on Meridian Street. His cousins worked at Lantern Room. One of his cousins (Uncle Kenny) cooks at House of Cheung for Peter Cheung now. We go there for “old school” Cantonese cooking like the chicken chow mein and egg foo young. Sometimes, we go to Lotus Garden in Greenwood too. Lotus Garden still grows their own beansprouts which is really hard to find anymore because it takes up so much time and care. As a 4 year old, I remember my father coming home from work and sometimes he would have a bag of cookies or pastries from the Roslyn Bakery. Sometimes we took the bus downtown to see my Dad’s cousin who ran the Charles Jung and Son hand laundry on Ft. Wayne Street. Our branch of the Cheung (aka Chong) Family moved to Evansville where extended family members and in-laws still operate several restaurants. Don’t forget the Hong Kong Inn at Franklin Gables Shopping Center. Now the children and grandchildren of these families have assimilated and are living the American Dream. Our parents’ hard work did pay off. I have so enjoyed reading this thread. Will be sure to share with my Dad and translate word for word! I was wondering the same thing about the House of Cheung. We ate there a lot in the early 80’s. I remember Peter Cheung and his elderly mother with fond memories. We lived at the apartments on the NE corner of 36th and Meridian, the one with the pool in front. Is it still there? Any history about it? I grew up in Indy, and haven’t been back since 2002, but love this site and its stories! I grew up in the 500 block of E. 36th St. (across from the park) and Mandarin Inn was our going out spot – but also occasionally the Kopper Kettle, the Iron Skillet, Renee’s and the Hilltop (? ); Hollyhock Hill was for special occasions. I learned to love Chinese food and especially rice there. The managers and family were extraordinarily kind to a little girl, and I remember getting a special hard candy at the end of a meal in addition to the fortune cookies. I called the candy “garbage cans” because of the shape. It had an unusual flavor which I have rarely come across since. I still yearn for those plump crispy egg rolls; what one gets nowadays is a sorry excuse in comparison. After we moved up north into Hamilton County, we did not go there anymore. 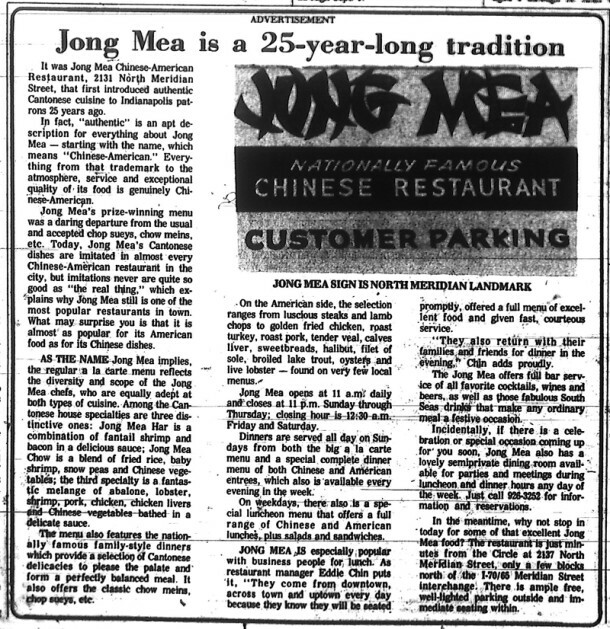 My father often had lunch at Jong Mea – he would go with folks from his office at 1433 N. Meridian (a building that bore his name from the early ’80s until WFYI bought it and tore down the name, throwing the letters away, despite assurances to the contrary at the time of sale). There they would play bridge over lunch in the quiet atmosphere. When I was in from college, I occasionally got to join him there. By that time, I had had the opportunity to travel to Hong Kong and my experience with Chinese food had advanced beyond the Midwest variety. Now we own a wok, so rarely eat at local Chinese restaurants. Thank you for your comments. 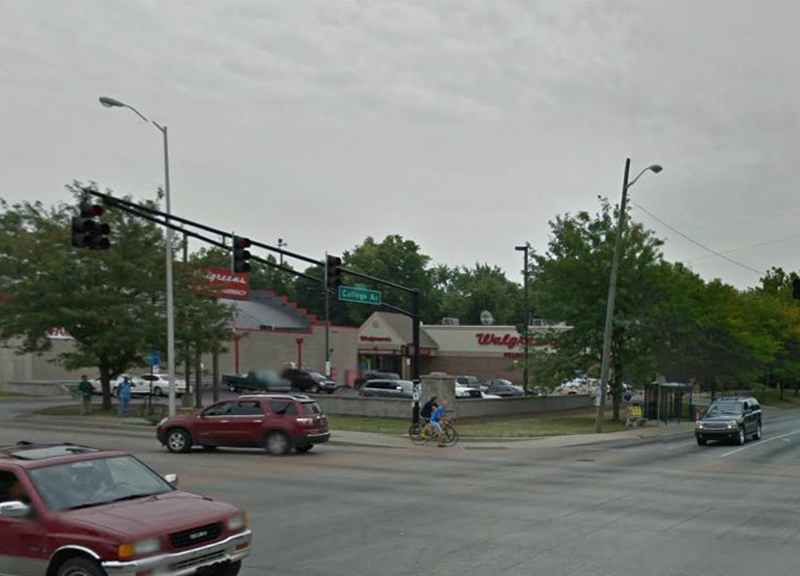 You mention growing up on 36th Street, across from the park, as well as mention the building at 1433 N. Meridian. I am familiar with both. 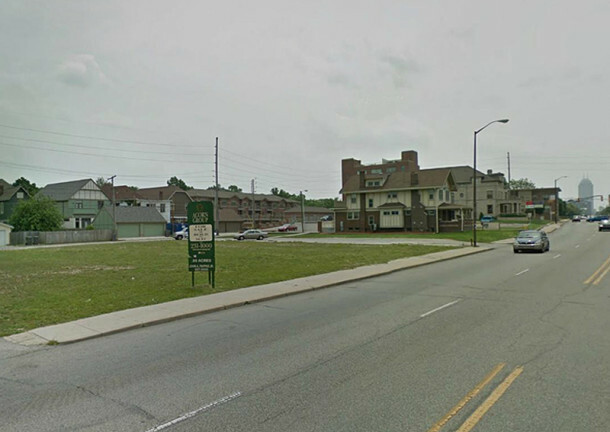 Regarding McCord Park, my family lived on Ruckle Street, just a couple of blocks from there. Regarding the office building, my mother was chair of the Marion County Mental Health Association’s annual holiday Gift Lift for a number of years, and their office was located in the building. Also, as a teenager, I babysat the children of the director, Norman Skole. I’m sorry to hear that WFYI didn’t honor its agreement to retain the name on the building. Ah, yes. Norm Skole was a great guy. So many people contributed to the naming of the Joseph Russell Brown building. I was abroad when the name came down and only found out about it through a cousin who had driven up and down Meridian St. looking for it and not finding it. Ditto, ditto, ditto…I concur with all the favorable comments on The Mandarin Inn. My grandfather lived on Maple Court (think now it is 39th Street, first block east of Meridian), and later in life he returned to 38th and Meridian to the large apartment building just south of the southeast corner. So we didn’t come to see Grandpa and Grandma without making a reservation at the Mandarin Inn. The most similar recipes at a local restaurant today are, coincidentally, at the House of Cheung, just east of 71st and Keystone. I know it’s not Indianapolis, but Indianapolis people have always gone to Lake Wawasee, Lake Tippecanoe, etc., and flocked to Foo & Faye’s Restaurant in Syracuse, now long closed. Can any of your readers or Mr. Cheung shed any light on that restaurant? Thanks for a great article…no one makes egg rolls that compare to Mandarin Inn’s anymore…cabbage, all cabbage, nowadays. The House of Cheung owner and head chef worked at the Mandarin Inn for several years and is a great chef and great guy! My brother goes there to have some of the dishes prepared in the Mandarin Inn style…especially the egg rolls. When I meet people on the West Coast, and they speak of egg rolls with more than cabbage, pressed duck (Wor Shu Op), Moo Goo Gai Pan, and egg fu jung…I know they grew up eating Chinese Food in the Midwest. So great to hear from all of you on your Indy eating memories.. I have discovered an original Jong Mea menu like the one pictured here. It lies at the bottom of a drawer in my kitchen where it was stored along with telephone books and several other menus of restaurants long gone – they were paper and have been recycled. It is in mint condition. Wow. What a great find. 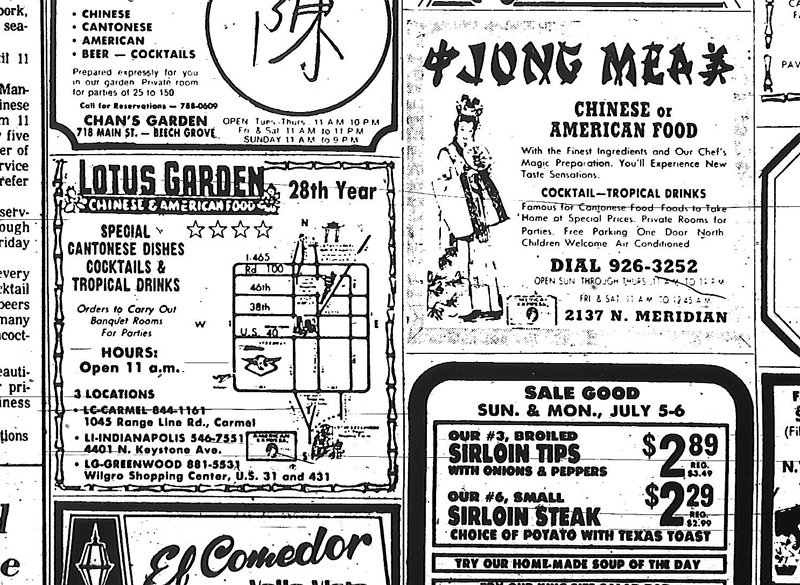 Both the Jong Mea menu and the telephone books might some day be valuable to certain collectors, just as old postcards and matchbooks are. My Grandparents and parents had been going to Jong Mea since at least the early 60’s. My brother and I were brought up on their Chinese throughout the 80’s, best egg rolls I’ve ever had, the War Su Gai (chicken fried in almond batter with brown gravy) was always our favorite as kids. The last time I went there was in 1996 or 97 right before they closed, the owner recognized me from dining there with my grandad who had passed years before, still remebered him by name. I still remember being fascinated by the two pages of exotic cocktails in the menu… I never did get to have that tiki bowl i always wanted. I attended PS #66 on 38th street in the 60’s – and many times as a 4th or 5th grader would wander into the Mandarin Inn to buy an almond cookie for probably 5 cents or so. The owner would patiently / lovingly take one out of the big glass container and ring it up. I walk by many times and could smell the aromas of whatever was cooking — mouth watering and realizing I was out of luck as only a child without money can. My dad owned a Chinese restaurant in down town Indy in the -1940’s called the Shangrila . My brother was a cook at Lotus Garden at 42hd and Keystone. I went to ps#66 also. Did you have a sister named Sally ? My parents both worked at these restaurants. My dad, Richard, cooked at Jong Mea from the 1960’s to the 1990’s (also worked for awhile at Mandarin Inn). My mom, Mary Ann, wait tables at Mandarin Inn from the 1960’s to the 1980’s (also worked at Jong Mea and Lotus Garden in the 1960’s). Also, my two uncles and a cousin cooked at Jong Mea for decades, and I wait tables there in the 1980’s. I have a Jong Mea Menu from the late 1980’s (full size – not paper), but it’s much too large for my scanner. It’s also in rough condition, because it’s the one we used in the kitchen for making out checks. Some of the more popular items on it were, as I remember, Wor Sue Gai, Cantonese Chow Mein, Chow Steak Kew, Char Sue Ding, Jong Mea Har, Hong Sue Har, as well as fried rice and egg rolls. The American food there was also better than most American restaurants. My parents often talked about well-known customers at Mandarin Inn and Jong Mea, when I was young. 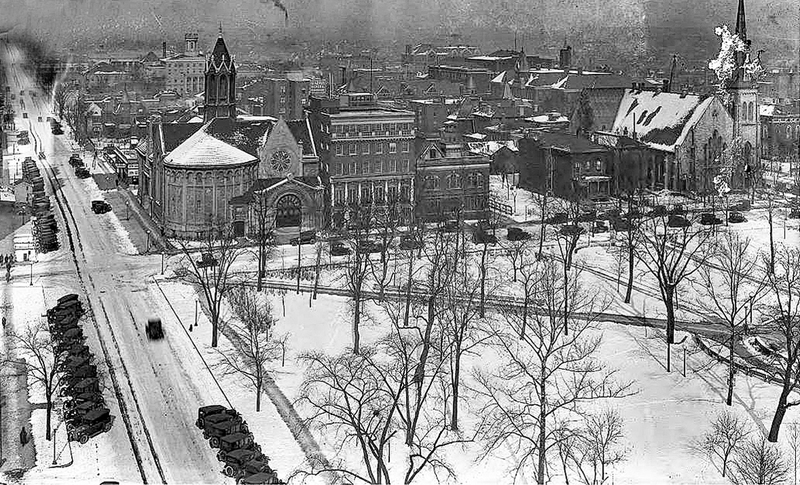 Among them were Andy Jacobs (he was also a onetime bus boy there), Judge Andrew Jacobs Sr., Jack Benny, Rock Hudson, Frances Farmer, Governors Bowen and Orr, all of the Indy Mayors through Hudnut, Father Boniface Hardin, Rev. Mozel Sanders, Red and Russ Dellen, Amos Brown, Rev. Andrew Brown, Bobby Knight and so many others, including the notorious Jim Jones. I worked at Jong Mea after its heyday, but I have personally wait on Gov. Bayh, Al Hobbs and other famous customers. I remember your Mom when she worked at the Mandarin Inn and all the names you mentioned who came to eat there. What a neat set of memories. My Dad was also an Indianapolis restaurant owner (he owned The Executive Club in the basement of the Guaranty Building in the 1970s, where Nicky Blaine’s now is), and the Mandarin Inn was the only restaurant we ever went out to that wasn’t his. Phyllis Young (pictured in the Star ad above) was always our waitress; we usually sat at the corner table straight left from the entrance; we never went unless Henry and Helen and Paul Cheung were there, and we could count on a visit from them during our meal. I could list the memories — the giant glass jars with fortune and almond cookies in them, the “kiddie cocktails” my brother and I were served, the Wor Shu Opp, the always-good-for-an-immature-laugh “subgum” dishes (I’ve never seen “subgum” on a Chinese menu since, and it always seemed a strange and funny thing to have “gum” in the name of a dish) — and fortunately, I have a small trove of family photos from a visit to the Mandarin Inn in what appears to be 1967 or 1968). I was also a high-school classmate of the son of Jong Mea’s owner, Eddie Chin, who unfortunately passed away while a student at Columbia University in New York.